One of the first pleurothallis species to arrive in our collection in the early 1990s was Pleurothallis secunda. This is a medium sized plant that each Christmas produces a multitude of short pendulous flower stems that carry up to ten quite large (1.5cm) red and white flowers. The species is found from Venezuela to Peru on the trunks of trees in wet forest. The habitat provides the key to successful culture where plants are straight forward as long as they are kept moist and shaded. To much sunlight results in the leaves turning pale and developing black blotches so mounted plants, especially, are grown low down. Plants develop into large clumps but are easy to divide and propagate. I went to your orchid Christmas and really enjoyed it. The flowers were beautiful and had I thought was suprised at how different they all smelt to our native flowers, roses and wild flowers. It was more like going into a university than a school, much better than the school I went to. I also enjoyed your non alchoholic mulled wine, plese could I have the recipie. Thanks Charlotte – glad you enjoyed the evening. Our non alcoholic mulled wine recipe is, mostly red grape juice and orange juice, a little apple juice and pineapple juice, cinnamon stick, cloves in satsumas, one star anise, some orange slices and a little sugar. Heat during lesson 5…final tidy up of the greenhouse and then reheat. Thank you for the recipie, i don’t drink because im diabetic. Will look forward to making some. Lillie says Hello. Hi Writhlington students – you guys are doing a fabulous job – congratulations!!!! – this one is actually P. lindenii, not P. secunda – at some point someone, I think it was Dunsterville, used the wrong name for the species in Orchids of Venezuela and ever since it has caused confusion. “Secund” means all on one side – referring to the flowers on the raceme – while these face alternately in opposite directions. I’d love to help identify the Pleurothallis species in the Writhlington collection as they flower. Happy New Year. Mark (Dr. Mark Wilson, Colorado College). 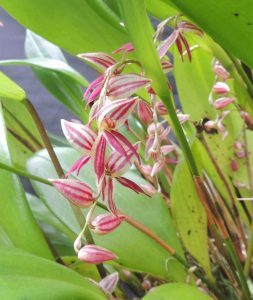 Thanks for your help Mark – we would really appreciate help in naming our Pleurothallis. Many of our plants have been donated by growers who themselves may have had plants for a very long time and so names are easily lost, mixed or incorrect in the first place. Thanks also for your kind words which I will pass on the the team when they return to school after the Christmas holiday. I have a great team of Year 8s (that is twelve and thirteen year olds) who are in charge of Cool Americas and so I will get Ed, Amalia and there team to get in touch with you.